Is a 3.1 mA battery drain after charging a concern? My equipment...Luna, 52 volt-3 amp Mini charger with three position switch. 80,90, and 100% settings. With the two LED bulbs. Luna 52 volt 11.5 ah bottle battery with on/off switch. After reading a few threads stating that the battery will back-feed the charger after it shuts off, I verified that this does indeed occur for me at a rate of 3.1mA. Questions...? Is this why you have to remove the charger after charging to 100%, allowing the BMS to balance the cells. Then repeat a couple times. And after a 80 or 90% charge would this amount of loss be a concern? Say if you where to leave it to charge at a leisurely pace overnight. See my completed Magic Pie V5 rear hub motor E-Bike build HERE. Too small to matter, I think. Voltage won't fall fast enough to impede balancing. If the drain was continuous, you could leave it for 2000 hours and only use about 6 Ah. And the charger should cycle anyway to top off. Fabrication is fun! Build something today. Show someone. Let them help. Inspire and share. Spread the desire. 3 mA is probably just the LED. A very funny thing too... I'm very familiar with diodes in series. I've got several batteries so I like to keep them about 80% charged and I can either run them from 80% or throw them on a charger for an hour to bring them to 100% before using. I put two 5A Si diodes in series and then when the charger shows complete I unplug it and end up with about 80% charge. To bring it to 100% and balance I jump the diodes out with an alligator clip jumper. If I forget and leave them on the charger with the diodes in series, no harm, it will just charge it more than the 80% but very slowly. I guess eventually it would bring them all the way to 100% but I've never forgot for more than a day or two and it's not gotten more than about 90%. Poor man's approach to 80% charging... not perfect but plenty good enough for me! Thanks for the replies, and doing the math! I feel better about it now. So why does the charger have to be removed to balance at 100%? But why is it recommended to disconnect it (the charger) after hitting it (100% charge) for a few hours? I think you may be referring to an earlier post that suggested with new batteries (or a battery that is suspected to have cell balance issues) to charge them fully to 100% and then discharge them a bit with a light load and then charge them again to 100%. In that post the reason for doing this is that when a battery is not well balanced it can take several balancing cycles to get it well balanced. Just my guess... there is no other reason to disconnect once at 100% perhaps aside from it not being a good idea to leave a battery at 100% for a prolonged period (I avoid leaving them at 100% for more than a few hours and rarely more than a day) but that applies even if off the charger... That may be a bit more OCD than the derived benefit (longer life for the battery) but it's what I do. From my logs I'm comfortable that charging every time to 100% is harder on the batteries than charging to 80-85% typically and then after several cycles of this a couple to 100%. I have two nearly identical batteries with almost the same miles. One was charged to 100% every cycle for the first 6mo of its life and the other following my routine. The one that got charged to 100% does not hold quite as much charge (Ah) measured by batt-man and comparing to initial and final voltage and the voltage sags more under load (higher internal resistance). Excellent! Nothing beats experience and real time data! Thank you. My 52v Mini is appears to be intermittently draining the fully charged battery when left plugged in overnight. Charges to 58.3v then in the morning it has dropped to 54v. It doesn't always happen though. Have I got a faulty charger? A 52 mini should charge to 58.8 volts. You should read this right when your charger shuts off, assuming that you have a good quality calibrated meter. This is when cell balancing may take place if required by unbalanced cells. Perhaps a volt or 2? I'd check the non-charging amp draw drain by the plugged in charger first... should be around 3 mA as per my experience. If that's O.K. Charge and immediately disconnect charger and see if problem persists. If so it must be internal to the battery. Yes I will test the drain with charger connected next. Battery is out of cradle. Charged over night, sometimes only drops buy 1 volt but others by 3 or 4 volts. I disconnect it now, when I remember, once charger stops so I don't get range anxiety on the way to work. I have connected an amp meter and don't have any leakage/discharge happening. Seems to be an issue with the charger not coming back on when the voltage drops. I have to unplug and replug (so charging restarts) at least 3 times before I get a full charge. I was caught out again today, because I forgot to replug when I woke up. Only 55v resting volts overnight. Had to drive again! Now, you need to know what you are doing, don't just randomly change things, or accidentally raise the cutoff voltage. Check operation after any adjustment. If you turn anything, take a photo or mark it, or better yet, also measure with DVM, so you can go back if needed. On my Cycle Satiator, originally it would cycle off during balancing. I reduced the cutoff current, and now the charger stays on until balancing stops. Basically holds 58.8V until the BMS is dissipating less then the set value. Then it starts to cycle, pretty rapidly. Every few minutes, sometimes, it comes on for about 1 second. That current threshold setting was 0.1A or something like that, as I recall. Anyway, maybe adjustment info will help optimize the charging behavior during balancing. I don't know that what I did was needed for proper charging, but I had gotten hundreds of cycles recorded on the charger's lifetime pack history log, in a week, and was trying to fix that. I never quite did. Last edited by JPLabs; 11-02-2018, 02:11 PM. Thanks JPLabs but as per attached, my charger has a different layout to both on that link. Maybe I have a Mini V1 not V2? Any idea what my P1,2 and 3 are? BTW: My open circuit voltage is 58.7 and Current cutoff is 260ma. Last edited by eCooker; 11-08-2018, 04:57 PM. I don't know how to translate the adjustment to that model, no, sorry. But, your voltage and current check out, I think it's all good. I see no issues. Thanks. Not sure why I have to unplug and replug multiple times to get a full charge then? Some Luna chargers are known to work that way. Mine both do, too. Not sure why, either. Cutoff current set higher than needed for a particular BMS, is my best guess, per my above. Will that help me identify my Pots? Should I look on the bottom of my board maybe? P1 is CV (Constant voltage) adjustment. turning this pot will change the final voltage. 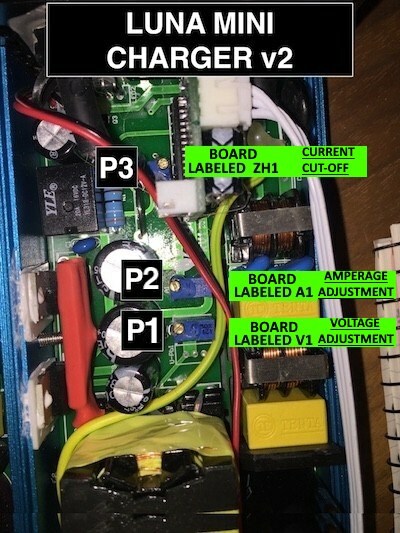 P2 is CC (Constant current) adjustment. turning this pot will raise or lower the max current in the constant current phase. P3 is the current cutoff at the end of the charge cycle. Basically what will terminate the charge. turning this pot will change at what amperage the charger will stop. Normally is will cutoff at around 5% of the max amperage. So a 300W set at 5amp will cut the charge to .25amp (regardless of the amperage switch position). This is how my board looks. And how it is labeled.